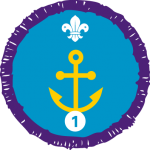 The Nautical Skills Staged Activity Badge can be achieved from Stage One through to Stage Six. Take part in a water activity taster session such as paddle sports, rafting, sailing, windsurfing, or pulling. In addition, you must correctly identify the different equipment used for the activity chosen and gain an understanding of the safety equipment used. Take part in a water activity taster session or at least one hour such as paddle sports, rafting, sailing, windsurfing, or pulling. By the end of the session, you should be comfortable in your craft. Take part in two, one-hour, water activity taster sessions such as paddle sports, rafting, sailing, windsurfing, or pulling. Develop your skills in two water-based activities and show competency and technique in launching a watercraft, manoeuvering a watercraft, communicating within a group, and knowledge of safety.